A mere year and a month after the tour I have finally have completed my update for 2009, wrapping up my documentation of this tour. This post is the index to the tour with links to all of the blog entries, which have been updated with better (though of course still flawed) grammar and improved syntax and all of the photos that I have recently uploaded to Flickr. Since returning from the tour I’ve spent a decent amount of time thinking about it, especially when I’ve been out riding. This tour was the longest one I’ve done to date in both time and miles and in many ways I considered it a sort of benchmark for future touring related activities. When I did my first tour up in the San Juan and Gulf Islands around day 11 I recall becoming pretty despondent with the solo touring experience. I enjoyed my days but when I’d get to camp at night I’d wish I wasn’t on my own. On that tour, done in the spring, I’d rarely encounter anyone at the campsites and it was a quite solitary experience. At the time I felt that if I’d done it for perhaps another week I’d break through that sense of loneliness. This tour would test that, but also my endurance over that length of time. People engage in Cycle tourism for a variety of reasons, from an excuse to ride all day every day, to sightseeing, to meeting new people, to a love of travel at a reasonable pace. For me, while all those reasons are a component, the primary interest is contemplation. Keeping to a reasonable pace it is easy to allow ones thoughts the freedom to roam further then even a bicycle can take you. With so much time all aspects of your life can be examined and meditated upon. There is a kind of alienation to the solo trip, but a unique kind of insight as well. Traveling through communities one is the perennial stranger, but at bicycle speed you see things that even the most hardened local will not be aware of. It is easy to feel more and more separated from the rest of humanity as your pace and goals become so different. People in general surround themselves with distractions; be they work, family or entertainment. As you cycle every day your distractions become very narrow: the world around you, your routines of camp, the few books you have with you. Car culture and its inherent impatience seem more and more insane and the destruction of the nature that you spend so much time in more and more horrific. One’s priorities shift and it can be difficult to remember that you yourself are on vacation from the traditional lifestyle and will be returning to it in some capacity. The true value of the tour will be in how these lessons and observations change the life you return to. The riding each day kept this quality and I was always enjoying it – the scenery was fantastic pretty much everywhere, the riding satisfying and rarely a slog, there was lots of neat things to see from historical places to quaint little towns. But I began to somewhat not look forward to arriving in camp. I can pinpoint exactly when this feeling began, it was right after the Avenue of the Giants in Northern California. This was the first campsite was was rather limited in space and quite packed with tourons. From here on out this would be the standard experience, even when riding further to other campsites that weren’t the specified destination in the guidebook. I like to have space and to be able to get away a little bit at camp and I think that it was simply the crowded conditions that made me not really look forward to the camping part of the day. I began to try to get to camp fairly early to try to stake out a good spot which meant I wasn’t always lingering as much as I should. I don’t want to belabor this, as for the most part as soon as I’d leave camp I was right back in my normal mode, but this was an aspect that I can’t deny. The very last campsite, Bodega Dunes, it somewhat came to a head as there were many tourons there, many in the “tour rat” vein that I mentioned before and I pretty much decided to not camp the next day and pushed through to SF. I appreciated the extra day in the city so this was fine for the most part, but I was really sick of camping at that point. So what does that bode for future, possibly longer trips? Well I’m not entirely sure. I’ve always intended to do a cross country tour at some point which would be three to four times as long (75-100 days seems about typical) so could I do it? I think I learned a lot from this trip about what I’d have to do different in order to do such a trip. I took a rest day every week, in general riding 6 days and taking one off. In a cross country trip I think one would want to preserve that, but I think stay in a hotel on that rest day. Also the taking an occasional two day “weekend” rest would probably be smart. This would break up the camping a bit more, get one out of the “pack” you are with and allow for a different kind of rest. I’m also not entirely sure if there had been a lot less people if I’d have burnt out on the camping experience. On a cross country trek I kind of suspect you’d see a lot less people. Especially since there really is only one route down the Pacific Coast but many ways across the US and people tend to go both ways ( on the PCT North to South is the preferred direction I met maybe a half dozen people total doing South to North). Running into people less frequently would I think make meeting them a pleasure, at least that’s how I experienced it before. Let me again stress here that most of my fellow tourons were great people and there was a number of them that I was happy to see each night. It was more the crowding I think, if I hadn’t done the hiker/biker sites it probably also wouldn’t be an issue. Of course most campsites were full by the time I arrived so it was really the only option. This of course is another option I think: wild camping on some nights, staying in normal campsites on others. WA/OR/CA are pretty much the only places with the H/B sites so this point might be moot anyway. The other thing was that I have a lot of interests: music, art, reading, film, etc., and most of these were rather neglected on tour. Having the iPhone helped a lot, I kept up with certain other interests as I went along and never felt completely disconnected from the communities I was part of (I should stress that I was as connected as I wanted to be, which was at a pretty low level. I don’t need to escape from everything on these trips, but I want to escape a lot). I also would check out art galleries as I’d go and I caught a few movies too. I did get a lot of reading done, that certainly is not an interest one has to forgo on a bicycle tour. Music of course is a major passion of mine and that definitely was neglected the most. I had a lot of albums on my iPhone, though I infrequently dipped into them, it is more seeing live music and playing music that fall by the wayside. I think on a longer tour I’d bring some sort of instrument with me, though that could certainly be unneighborly. Seeing live music, especially the more abstract things that I like is just not going to be a common occurrence on these sorts of trips. In the main I think this is survivable though, I’ve been known to go months between shows in dry seasons at home. Ultimately I think its being part of an active community that I began to miss: the art openings, the concerts, meeting up with people at events, etc. The traveler is never truly a part of anything, always a stranger, always just an observer, never a committed participant. Even those who throw themselves into the places they are in, they are never really a part of it. For after the festival, or fair, or even just day at the park/beach/what have you, everyone else stays and lives the day to day while you just move on. Everything is a mystery to the traveler, which is part of the appeal of course, but there is also a pleasure of knowing what things are and being a part of them. If you read through all my blog entries on this tour I tended to focus on the riding, the incredible sights and the good camaraderie that I did have. In the main this was my experience and I post the above to outline some of the other things I felt, experienced and thought about. I think about this as touring is an activity I love but it is not without its trials: nothing is constantly a good time, in fact if it isn’t somewhat mixed as an experience I’d wager it pretty much isn’t a good time. As should be obvious I think about this in context of further touring, which clearly I intend to keep up. 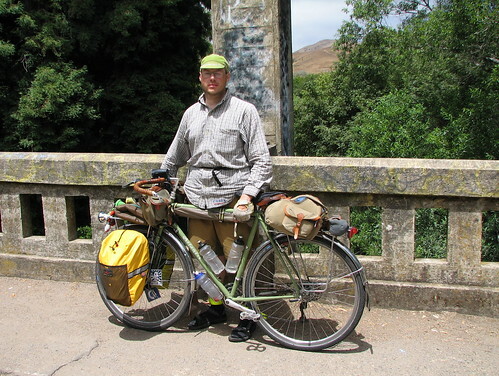 I also focused on the mental issues in this post, as all things considered I had very little issues with gear, the route, the bicycle and such. Every tour though I try new things and see how established things work in different circumstances, so I’ll cover that aspect in a future post. I promised one last post about the final few days of my tour and I apologize for the delay. I’ve found that on returning from tour I tend to focus on all those things that one neglects on touring to the exclusion of tour (and cycling for the most part) related things. I should say I was right back to my regular bicycle commute to work on my return, but I have been spending my weekends at art galleries, concerts, art festivals and just relaxing. Starting to get the itch to ride around again as summer is feeling on the wane. Anyway this is a record of the return trip home, which was mostly by train but also added a few more miles on the bicycle. 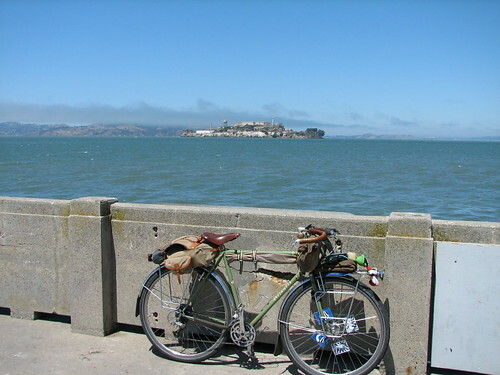 I spent two whole days in San Francisco in which my bicycle never left my hotel room. I should say that I had no trouble with the bicycle at the Hotel Triton and the staff was really great. The day I left I saw another cyclist pushing his bicycle into the elevator and on seeing me he commented “I thought I was the only one!”. It wasn’t a cheap hotel by any stretch, but it was about the cheapest I found at its fantastic location. I walked all over downtown over those couple of days and saw a concert, visited SFMoMA, Yerba Buena Center for the Arts, the Cartoon Museum, City Lights Books, the Beat Museum, saw a couple of movies, walked all over China Town, the arts district, North Beach, ate at the Stinking Rose, downed many an Anchor Liberty and Anchor Steam and caught up on my sleep. It was a good couple of days, look for writeups on the art galleries on my other blog, but Monday rolled around and my stay in SF was coming to an end. Now the Amtrak from SF to Seattle leaves from Emeryville (right next to Oakland) and it leaves around 10pm, so I had a whole day to kill. 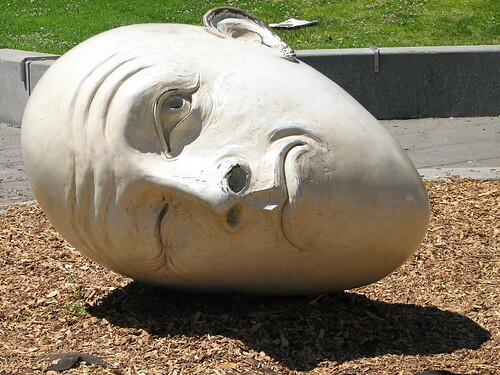 I’d originally thought I’d go up to the de Young Art Museum and spend the day there, but it turned out to not be open on Mondays. 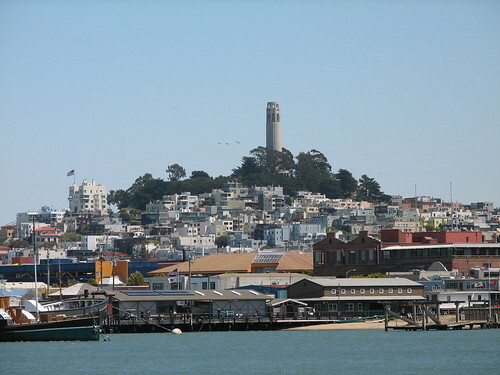 So I ended up just riding around the San Francisco waterfront and around town a bit which was actually quite nice. Checkout time at the Hotel Triton is noon and I pretty much lingered until then, having breakfast and walking around a bit before I checked out. 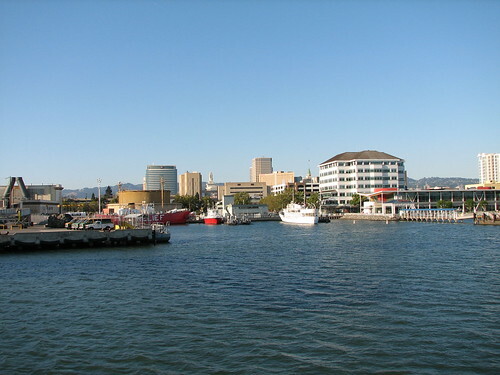 I was able to store my bags at the hotel, so I wasn’t too encumbered and I headed straight down to the waterfront. I wanted to get my ferry ticket and work out where I was leaving from right off so I wouldn’t be scrambling toward the end of the day. It was an easy ride through the city down to the waterfront, fairly trafficked but downhill and the cars seemed used to driving with bicyclists. Right across the street from a the Ferry Building, which is full of tourist type shops and restaurants, was a the Embarcadero plaza, a nice open park like space where I had lunch. People were taking down craft booths and tables being set up for a movie shoot – pretty active for a Monday morning. After lunch and walking around the park a bit I crossed the street to the Ferry Building where I was easily able to pick up ferry tickets that could be used at anytime and scoped out the terminal. Then I mostly just rode around the waterfront. there is a long wide boulevard along the water with a mix of tourist activities and port buildings. I rode up this boulevard checking out things as they interested me. The crowds got pretty large as I approached Fisherman’s Wharf where I spent about 5 minutes before I decided it was too tourist trappy and too crowded for a guy with a bicycle. I continued up the way until I reached a pier I could ride out to. 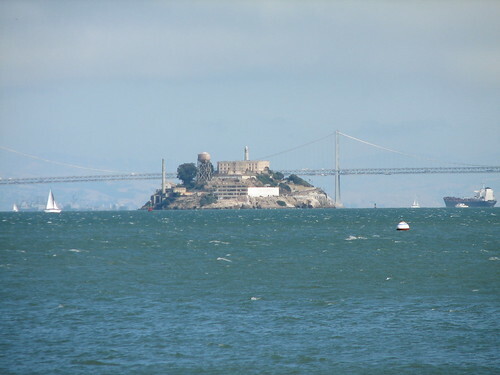 There I was able to take the above picture, as well as the initial picture of Alcatraz. There was also a beautiful schooner berthed just across the way. From here I rode up a steep hill into the SF Maritime National Historic Park. Down the hill from there was Fort Mason where I’d spend several hours. 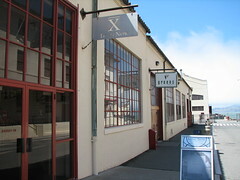 There was a place that sold discards from the SF Library system, galleries of local artists, the Long Now Foundation who had an interesting museum and Greens Restaurant. I really wanted to go to Greens (I have their cookbook and love their recipes) but they didn’t start serving dinner until 5:30 and assuming it’d take an hour or so I felt I’d be at risk of missing the last ferry. So I walked around the fort checking out all of the ways they put the old buildings to use as well as walked out to the end of the piers there, fighting a stiff wind the whole way. 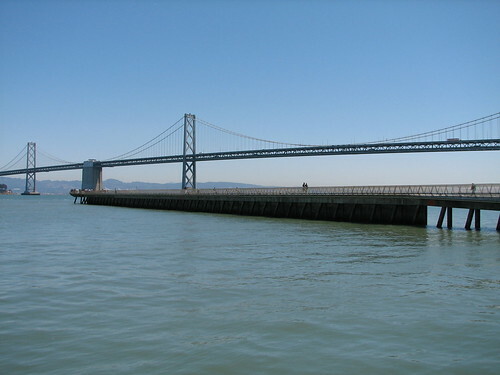 Eventually I decided I’d head back to my hotel and get my bags then have dinner at some place by the ferry building. I ended up doing a cross city ride to the hotel, navigating with my iPhone. This was pretty fun, I got to see bits of North Beach, Chinatown and Russian Hill as I cut back to my hotel. Of course I did end up hitting a few of those hills SF is so known for. Atlantis and Cable Car - can you be more SF? I returned to the waterfront the same way I’d done earlier in the day and cruised around the vicinity of the ferry dock for a restaurant where I could watch my bicycle which I locked up on the boulevard. I had a nice leisurely dinner at the Market Bar, whose outdoor seating allowed me to be only 20 feet or so away from my locked up Atlantis. I had a caesar salad, grilled Mahi-Mahi and of course a couple more Anchor Steams. I’m going to miss the fresh Anchor Steam readily on draft. Every day I was in San Francisco it was the same story- it’d be sunny and clear all day getting fairly warm (say mid 70s) by the afternoon. Then right around 5-6pm fog would roll in and it’d cool right down. This began while I was at the restaurant and I was glad that I was able to zip on the legs to my pants and put on my light flannel shirt that I had in my day bag. It was getting close to the time the ferry departed so I paid my bill and walked the short distance to the terminal. 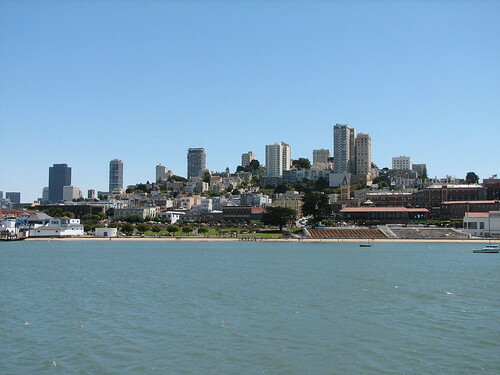 I had cut it just right and the ferry arrived within 5-10 minutes and I boarded and was zooming across the bay to Oakland. The ferry took about a half an hour with a quick stop at Almeda before Oakland. There was nice sights of the sun setting behind the city and industrial shipping and its services on the edges. 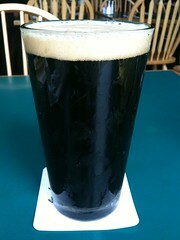 I was able to enjoy another beer on the ferry but soon enough we were arriving at the Oakland terminal. 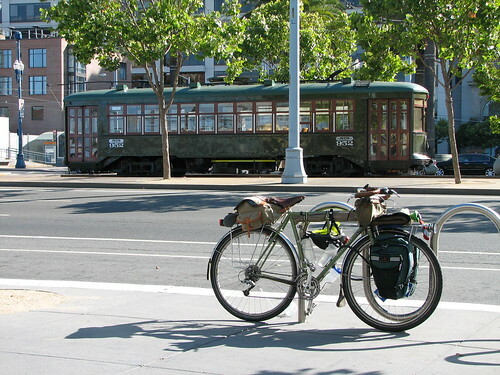 I unlocked my bicycle, zipped off my pant legs, donned my day bag and set off across Oakland. I’d setup this route using Google Maps Pedestrian routes (my guidebook had a BART based route which seemed way more of a PITA then using the ferry) and it turned out to be pretty great, winding through the back streets of Oakland. There were bicycle lanes on most of the bigger streets, but I only hit those at the end. Away from the city the fog was gone and it was nice riding through the late evening. 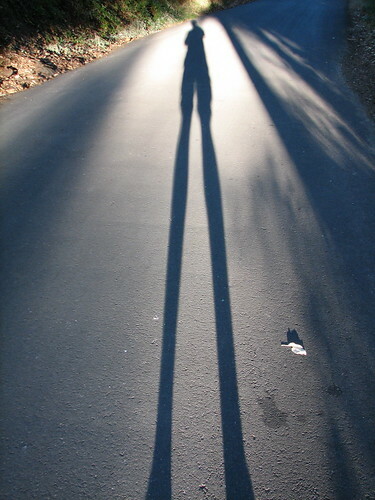 People were out and about in the sun at least until I went under a freeway and was in Emeryville. Now everything looked a bit less used and lived in like Oakland had, but it was devoid of human life. It was mostly warehouses and light industry admittedly, but the contrast was interesting. 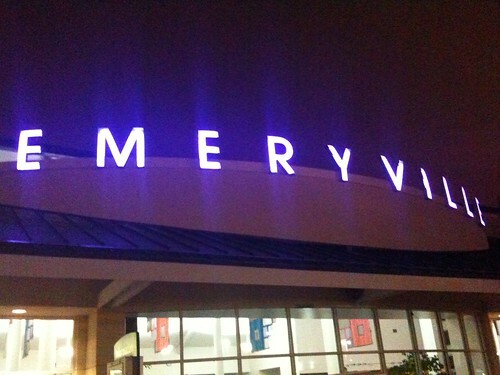 Around 7:30 pm after a mere 15 miles of riding, I arrived at the Emeryville Amtrack. I picked up my ticket, got a bicycle box (a free one that had been left there) and spent the next half hour or so boxing my bicycle and checking my bags. I was all done by about 8pm and thus had two hours to kill before the train left. Well as I said there was nothing around the Amtrack station but I walked around a little bit trying to find a place to buy some snacks for the train ride. I found a gas station and loaded up on various bits of junkfood. Then I returned to the station and read until the train arrived. Finally it pulled in and I queued up outside to get checked in. They lined us up based on destination and how many people we were traveling with. Most people were heading to Portland or Seattle though there were a few people getting off a various stations all along the way. I got my seat assigned and headed into the train. This was my first train ride and I really didn’t know any of the tricks. I’d assumed that it’d be like flying – you could get pillows and blankets and there’d be some sort of steward like person. Well they handed out pillows right off but they had no blankets. Wish I’d know that, I did of course have a sleeping bag in my checked luggage. I settled in my seat (I was solo in the seats at this point), but on my iPod and read for the next few hours. Behind me was a college aged kid and an older man who drank beers and whooped it up until the older guy got off a couple of hours later. After that I was able to relax and try to sleep. I have a hard time sleeping in general and have never been able to sleep in cars or trains. I put on a book on tape (William Gibson’s Count Zero) and gave it a try. All pictures from this day can be seen here. I did managed to catch a few fitful hours of sleep on the train ride, but also made it a good ways into Count Zero. I awoke before dawn as the train sat at some station in bumfuck northern California. It turned out that a freight train had broken down and we had to wait for over an hour before it was on its way. I hadn’t really explored the train much so at this point I was low on batteries on my iPhone so I set out looking for a place to plug in. I found one in the forward lounge car and I saw there reading as it got some juice. It turned out that about 45 minutes after I was sitting there they opened the dinning car for breakfast. Well that sounded good so I got in on the first wave of breakfasters and was sat at a table with three other solo guys. Most of us had slept poorly and we kept the (bad and weak) coffee flowing. I had french toast and most of the others had omelets. We talked a bit, several of the guys had done the train trip several times and filled me in on some of the tricks. We passed Mount Shasta during this time and the views from the windows were pretty stunning. We talked Tour de France a bit which of course led to me mentioning that my bicycle trip had coincided with Le Tour. 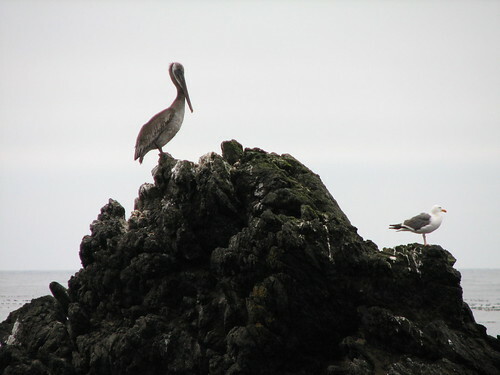 This interested them quite a bit so I talked a bit about the trip and camping along the coast. Eventually I headed back to my seat and spent the morning reading and looking out the window. For the last week in the Pacific Northwest there had apparently been a heatwave. The railroad that owned the rails that we were on as we tracked through Oregon decreed that when the temps are above 90 degrees (F) trains can’t exceed 55 miles per hour. So we really crawled through Oregon, it was disheartening when at times we’d parallel the highway and cars would just blow by. The train trip was mostly just sitting around and reading. I of course looked out the window a lot, but at times there wouldn’t be too much to see as the train would go through cuts in hills or dense trees. I got lunch from the snack bar instead of the expensive dinning car and discovered that they had Sierra Nevada Pale Ales (the menu only showed bad domestic beers) and I had a couple of those throughout the day. I spent some time in the lounge car to charge the phone back up and also to enjoy its large windows with seats that faced outward. Just past Portland I had dinner in the dining car, this time by myself at a table. However across the way was this total nutjob who went on and on about completely sketchy eschatology to his mostly silent companion. I couldn’t get out of there fast enough. I was really burnt out from lack of sleep and I spent probably the last six hours of the trip just looking out the window and listening to my William Gibson books. After Olympia the train wound along the coast on a bit of Washington I’d never seen before (though I’d often wondered about it as I drove up the I-5). 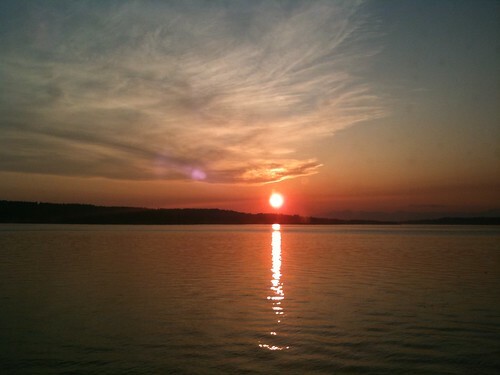 The sun set at as we approached Tacoma, which was the only picture I took from the train windows. I generally dislike pictures taken from windows, but this one came out pretty decent I thought. Tacoma was the last stop until Seattle and after 23 hours on the train I was finally on the last stretch. We pulled into Seattle at 9:30pm almost 24 hours total on the train. I waited for my bags to arrived and the box with my bicycle but only one front pannier turned up. The bicycles were out back and I got that (they chewed me out a bit about the weight – I’d stuck my rear bag and contents in the box with the bicycle) and asked about my other bag. Well they couldn’t find it so I had to file for a lost bag. I put together my bicycle, which wasn’t too bad as I had to just put on the pedals, straighten my handlebars and hand my bags. There was another guy there putting a Long Haul Trucker together which looked like way more of a hassle – he had one of their Nice Racks which wouldn’t fit in the box so he’d had to remove that. Score one for narrow racks. I went and filled out the form and they told me they’d send my bag to me by Cab if they found it. And if you don’t I asked? well then you have to fill out another form I was told. Great. Leaving the office I found the bicycle a bit unbalanced with only on front pannier so I ziptied my day bag to the front to balance it out and then headed out. I’d been sweating as I did all of this and I thought it was just the labor and stress. But no it was still 80-90 degrees as there was this ongoing heatwave. As I got outside the station was thronged with people – a Mariners game had just gotten out and I was right by the stadium and the nearest freeway entrance. So I walked the bicycle past this entrance and set off. Only to find none of my lights working. If you recall I’d setup the Ride & Charge to charge up my batteries as I rode. Well it was supposed to run my normal lights when unplugged but this never worked. It also was supposed to let you use its Ixon light from the generator but this didn’t work either. I tried running this light on batteries but all mine were dead. So I ended up ripping the wires out of the Ride & Charge and twisting them together. This worked and now well lit I set off. I’ve done this ride a bunch of times so there isn’t much to say. Uphill to the I-90 tunnel and then on the I-90 trail across the bridge, Mercer Island, the second part of the bridge and then onto the Lake Washington Loop. It was pleasant riding for near 11pm with it being so warm and I was filled with energy from all that sitting around the past 24 hours. About an hour and a half later at 12:10am, I pulled into my house and my tour was over. The other tourons in the camp talked late keeping me up, perhaps it’s the short timer syndrome, but I felt like I’d heard it all before. There is also a certain type of tourist, a tour rat say, that I fortunately rarely encountered but I can’t say I’m a huge fan of. This type of tourist is sort of being a bum by choice like those kids that are homeless by choice but know they can return to mommy and daddy if they need to. These tour rats try to scam things, brag about their stealth camping prowess and so on. There were definitely a few tourons in this category on this night and I have to admit I’d rather become tired if it. So when C&C said they were skipping the next campsite (where most of tonight’s crew were heading) and going straight to SF I decided to see if I could get an extra night in my hotel and do the same. I packed everything up, made breakfast and called the hotel from the campsite bathroom as I could plug my nearly dead cell phone telephone in there. I was able to get a an extra night so now my days ride was going to be a lot longer. I hit the road a bit after 9 but stopped almost immediately at the Roadhouse Coffee Shop in Bodega Bay just outside of the campground. I wanted a bit more coffee and I wanted to charge my phone more figuring I’d need it. Of course I ended up talking about my tour with a girl who had ridden the whole West Coast from Vancouver to San Diego last year. I left as soon as I could and I tried to set a good pace for this long ride. 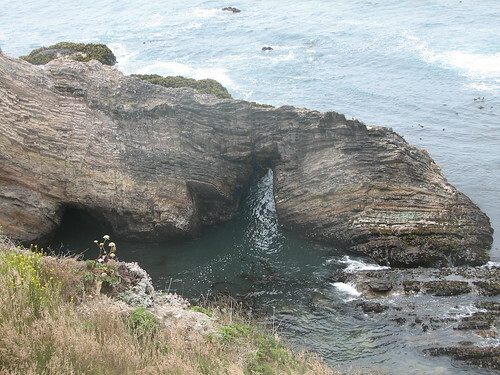 The route began by winding through these little towns and developments in and around these coves. But soon it turned a bit inward and was dry ranch land again. Pretty similar mix of terrain to yesterday as matter of fact. 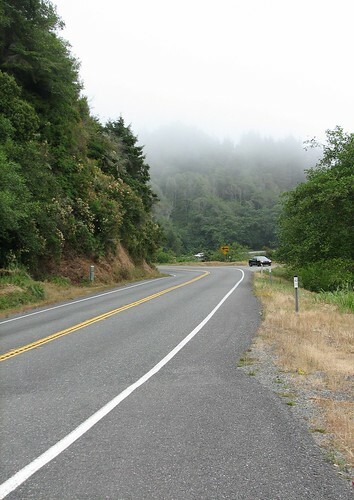 It turned south again and there was a couple of pretty hefty climbs before the road descends into the tiny town of Tomales which looked ultra quaint but I sped on. 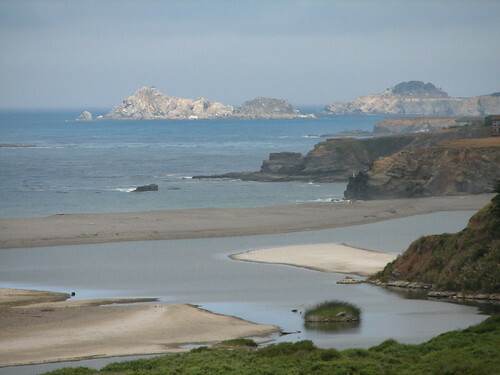 Highway 1 in this section follows a river all the out to the tip of Tomalas Bay and then bobs along the coastal portion. This had many short steep climbs, it sort of reminded me of riding on Whidbey Island, especially with the oyster farms. 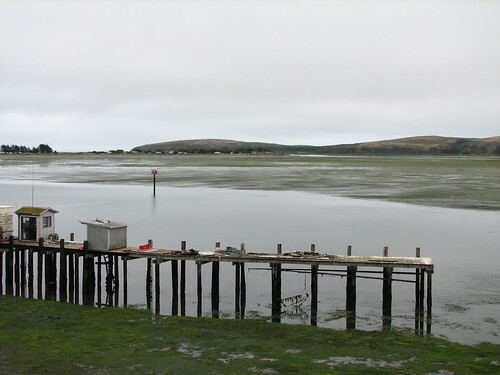 After a good long ride the bay met the mainland at the very neat little town of Point Reyes Station where I stopped for lunch. As I was cruising town looking at cafes I saw the Cowgirl Creamery which had a shop and cantina. One of the great small artisan cheese makers who I discovered in my recent soft cheese obsession. I had to stop there and I got a fantastic sandwich made with their cheese in wonderful locally made baguette. I ran into C&C there who are a bit of creamery hounds as they tried the ice cream. I myself got a handmade ice cream sandwich which was excellent. I did a quick spin around town but the road beckoned. 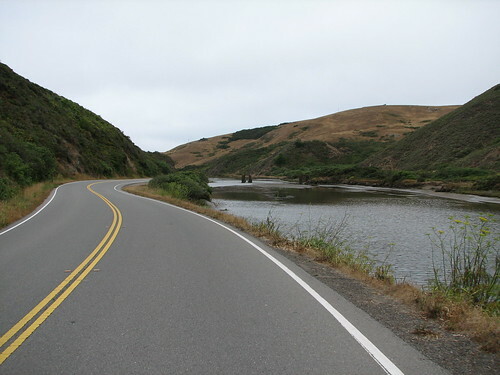 The route left 1 just a few miles from Point Reyes and went up the longest hill of the day. It’d been cool and gray but of course the sun had to come out for the big climb. At the top of the climb the route exits onto a bike path that led right into Samuel P. Taylor State Park which was the days original destination. I switched to the next set of cue sheets and headed out of the park (down the worst road) into dry desert-like hills for a few miles and then there was a long hot climb. After that descent it was all city riding, first through little towns, then suburbs and then a stretch on a bike path path ended in the coast a few miles before the bridge. I ended up riding with a local cyclist for a bit as I rode through these coastal tourist areas, talking mostly about my ride: he was very interested in the mechanics of touring. He rode on as I began the three steep climbs up to the bridge. I’d been fighting a headwind for a while but as I turned onto the Golden Gate Bridge it was more of a crosswind with a bit of a tailwind. The bridge crossing was fine ,even with the wind but in the other end I realized that the K&S route turned south and didn’t really go downtown. I had a map of the nearby streets to my hotel but not a connection from where I was. So I used the iPhone and Google Maps and got a route worked out. 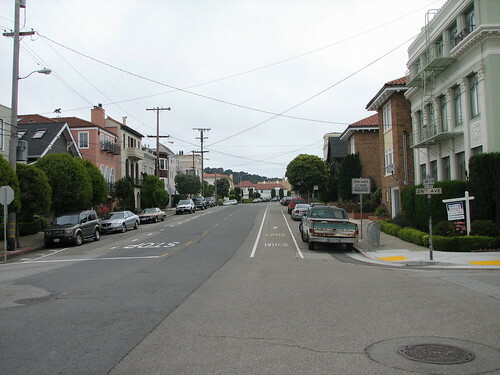 I got on and off the routes and got to experience some of San Francisco’s famous hills. But I made it in pretty good time arriving at my hotel around 5:45pm. Checking in it was entering a different world. I had no hassles with putting the bicycle in the room and I wheeled it up into my room no problem. Once there I didn’t really know what to with myself, but I eventually took an epic shower then wandered around looking for food. I settled on Thai which I’d been jonsing for. Then I went to a concert in a gallery only a couple of blocks from my hotel. This was pretty nice: a concert of the abstract music I like, the day I get into town only blocks from where I’m staying. Anyway the show was pretty good, after that I went back to the hotel and that was about all for the day. And the tour. So that’s it Seattle to San Francisco in 21 days. I’m not going to do daily entries here whilst I’m in SF, maybe some of my activities will end up on the other blog. But I will post about the trip home, so stay tuned. An old burned out hippy at Anchor Bay told us we’d have one more really good day of riding before suburbia begins. That day was today and it was indeed an enjoyable day of riding. It followed what seems to be the typical NoCal pattern of fog in the morning, burning off in the afternoon and then rolling back in the evening. 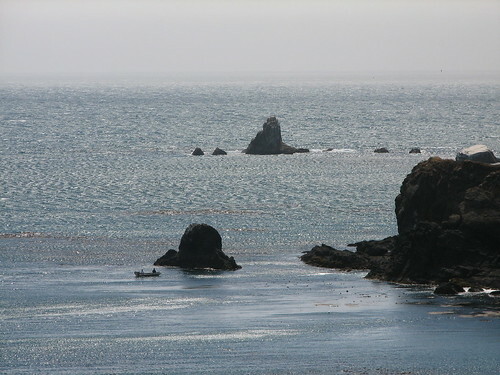 The riding has been pretty constant as well: on coastal bluffs through deep coves the force you to descend and climb. This morning the route was mostly a bit set back from the water and the land was all private and inaccessible. Expensive houses gave away to ranch land and the flora was almost desert scrub like. There was very few towns and the couple there were were just a convenience store and a gas station. Kind of odd only a hundred miles north of San Francisco. 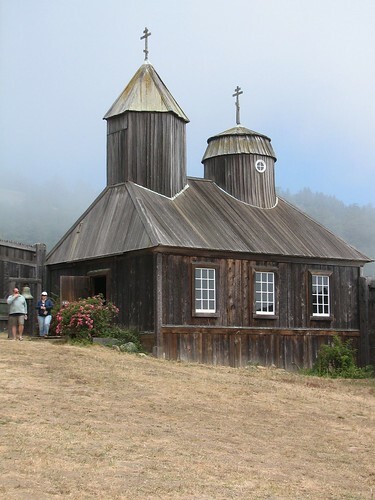 I stopped at one if these and got lunch which I ate at Fort Ross with C&C. I took a quick look at the fort which was a Russian outpost in the early 19th century but soon hit the road again. From here the route took a more strenuous turn: steep and longer hills, descents with super sharp switchbacks and cattle grates across the road to keep wandering cattle from the surrounding ranches in line. I did indeed see some wandering cattle. The day had cleared up but as we did the big 500′ climb in this part it was rolling back in. There was a pretty great descent from this part on seriously twisty roads. This was followed by another shorter climb and then we were done with this bit. 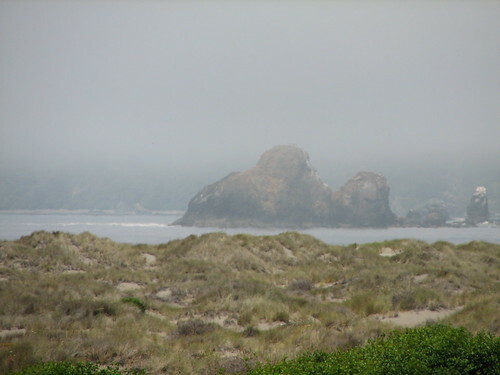 Coming out of the hills below the fog the beach was now becoming mostly sand with just a scattering of forlorn rocks. The road ascending on top of the bluff again and now it was mostly easy riding on gentle rollers for the last ten miles or so. There were people playing on the sandy beaches and others with surfboards (though I didn’t actually see anyone surfing), a pretty big change in character from the severe rocky beaches seen up to this point. 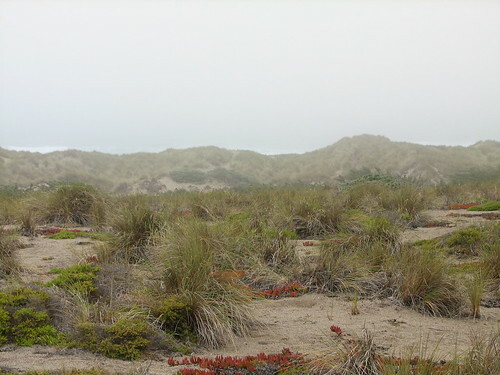 Soon enough I was a Bodega Dunes State Park where I set up my tent in the sandy dunes. It’s pretty windy and cold here and pretty full with mostly a new group of tourons. I walked most of the way out to the ocean but it was far off across sandy dunes and quite windy. So I gave up before actually reaching the water and trudged back to camp.That’s it for today, tomorrow is the last full day of riding; kind of hard to believe. 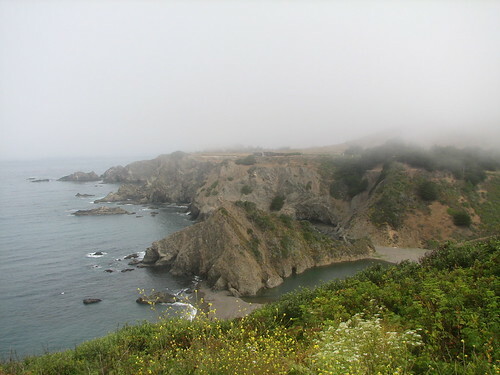 This morning dawned drizzly and gray and the coast was again streaming with fog. 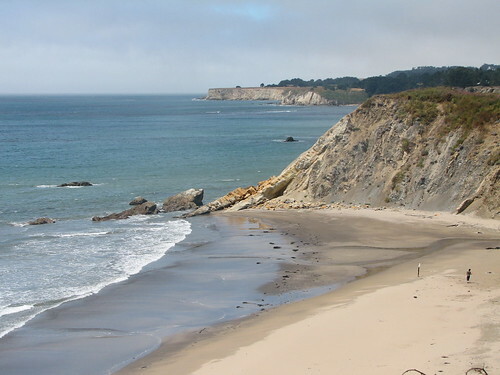 It was going to be another moderate day mileage wise and I was determined to relish the NoCal coast. So I took my time through the rolling hills that dominated this day of riding. There were several points where a deep canyon would cut into the bluff and the road would descend into it, take a small (shoulderless natch) bridge across it and then climb the other side. The fog wasn’t all encompassing this morning so when viewpoints opened up I could see headlands extending into the gray ocean with rocks cutting through the fog. The road turned inland just a bit and it was brown scrub land on the bluffs and farmland on the eastern side of the road. The road still rolled up and down but was pretty gentle for a period, though it would descend and climb out of these river valleys and after a bit not to many miles returned to the coast. There was very few communities for the first twenty-five miles or so, just farms, houses and the bluffs. At a place called Irish Beach the road dived into a particularly deep canyon and twisty climb out featured (according to the K&S) the steepest grade on the whole route. It was indeed steep but thankfully not too long. Not too far past that climb was the campground originally billed for tonight but as I was now riding somewhat off the daily routes I pressed on. Reaching Point Arena there was a little cafe and it was almost lunchtime so I decided to take a side trip out to the Point Arena Lighthouse which was down a two mile road. 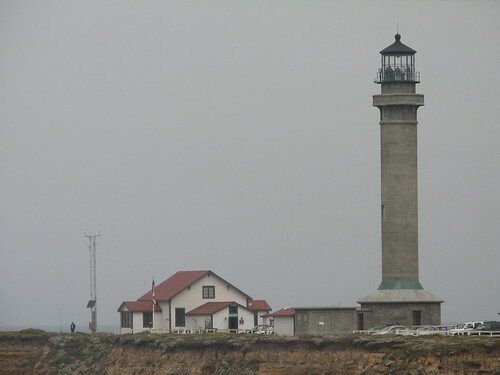 It turned out that you had to pay US$7.50 to get onto the grounds of the lighthouse, so I chose to photograph it from afar. Riding back I had a nice tailwind pushing me back to the Rollerville cafe which bills itself as the “last cafe ’til Hawaii”. I had a grilled cheese, fries and the big winner: an espresso milkshake. 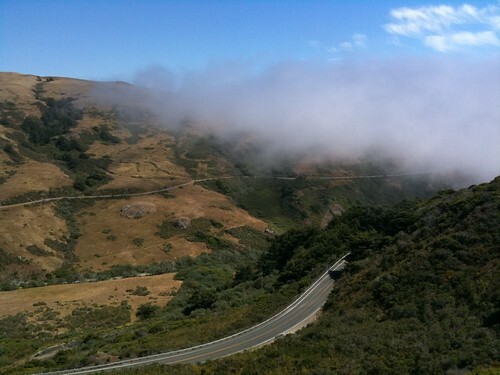 The sun had burned most of the fog away by this time and the riding was really pleasant right along the headlands. There were short rolling hills that you could almost always get enough momentum to crest from the downhill before it. At the top of one of these hills was the tiny town of Anchor Bay where I unexpectedly encountered the beerhounds and less unexpectedly C&C in front of a grocery store. There was a laundromat here so C&C and I did laundry as the beerhounds, hoping to put in a good few more miles headed out. 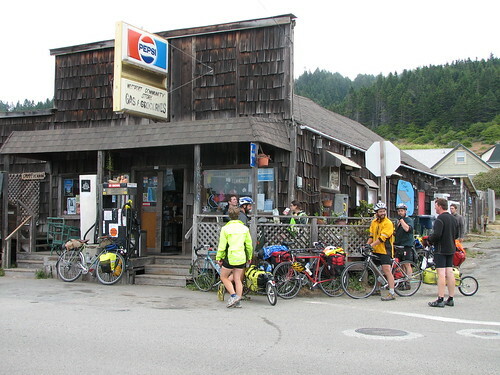 After laundry it was only 5 miles or so to the small town of Gualala where C&C and I stopped to get supplies. We ran into C__ there who would also join us at the Gualala camp. Leaving Gualala it was just about a mile before we crossed the Sonoma County line. The campground was only a half mile past that. Descending into a valley we arrived at Gualala Point Regional Park just a bit before 5:30. I set up and ate dinner during which C__ arrived. We all chatted until dark, mostly about San Francisco as we are only a couple of days away now and three of us are ending our tours there. Just before dark a bearded fellow shows up on a recumbent and sets up for the night. He turns out to be a a kind of perpetual tourist, working odd jobs and ridding on. An odd duck, sort of a quintessential hippie Californian. I got up early and left camp by 7:40 wanting to hit the legendary Leggett hill (the highest point in the West Coast route at 2000′) before the day hit the projected 90+ degrees. I was prepared for the heat but it was still chilly as I turned off 101 (yay!) onto highway 1. The climb up Leggett Hill began soon after and continued for about 3.5 miles but it was actually a nice winding gentle climb through the trees for most of the distance. So I never got overheated, on the contrary the descent was cold and quite long and at the bottom I rode into fog. Cold now I stopped at Redwood Grove (the last of the Groves) to put on socks and leg warmers. Of course there was then the next hill, the Rockport hill at 690′; thankfully the legwarmers roll down. This one was shorter than Leggett Hill but steeper and I was still a bit weary from the last hill so overall it was a bit of a slog. After another cold descent I was back on the ocean which I was happy to see. 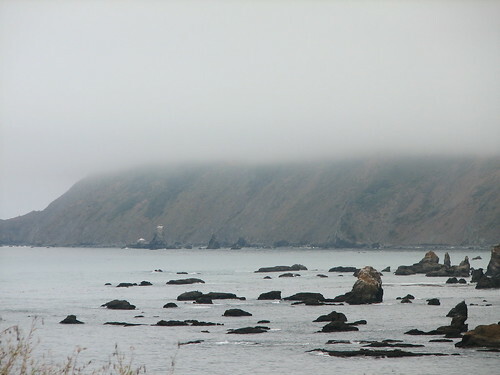 The fog was back as were the seastacks but they now are heavily fragmented and more like strewn rocks. Now technically I had ridden the days mileage Fort Bragg actually being 2 miles past the days campsite. 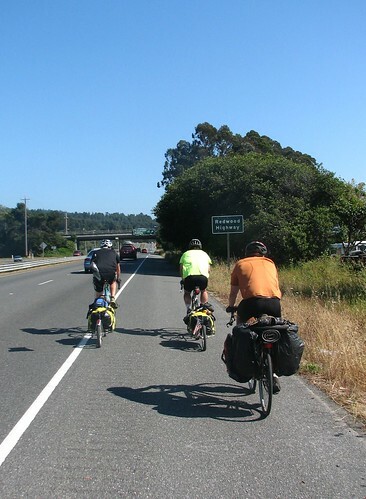 But it was so early that a number of us decided to press on another 16 miles to a site just beyond Mendocino. This was again pretty quick riding on the 1 with some ups and downs and a few shoulder-less bridges. Coming up on a side route to Mendocino I took it and spent some time in this quaint little hippie town. 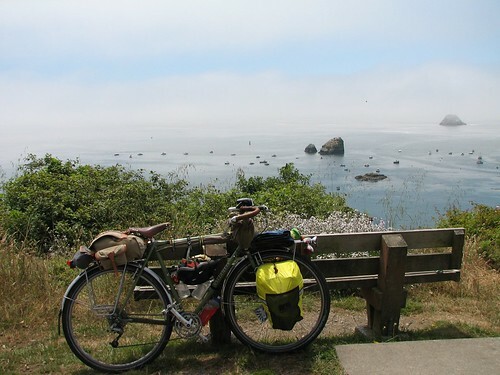 I resupplied my consumables and then rolled the few short miles to Van Damme State Park. They had a pretty small Hiker/Biker site but so far it was just C&C and the two German Girls besides myself. I set up made dinner and then walked around a bit. On my return I found another five cyclists had squeezed into the camp. It was cold and gray so I retired into my tent to read fairly early. If today was thought of like a sandwich the state parks would be the bread and 101 would be the meat. However to apply the analogy accurately the state parks would be like the best whole grain bread with Easy Cheese in the middle. Another small Redwood Park in about the middle of the days ride sort of spoils the whole analogy, perhaps it should be thought of as a Club Sandwich… Anyway the real signifier of this day would be the heat. It was already sunny when I got up but the trees in the campground kept it cool enough that I put on socks and my legwarmers. 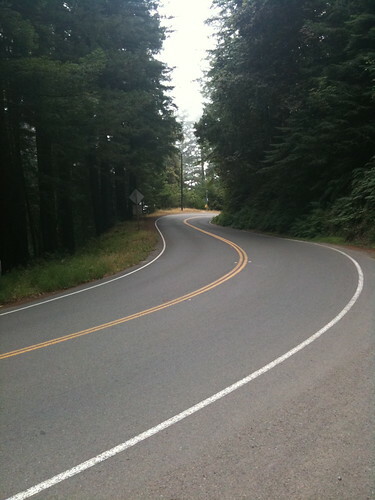 The route began with 18 miles on the Avenue of the Giants which was again fantastic riding. The trees were beginning to give away to more open space and the Eel River was the dominant feature of this days riding. There are a few little communities along the Avenue of the Giants and in Myers Flat there was an organic coffee shop called the Daily Grind where I spent a bit of time drinking coffee and using the WiFi. Their coffee was good so I replenished my supply with their darkest roast. It was now plenty hot so I took off my warmer clothes and applied sunscreen. 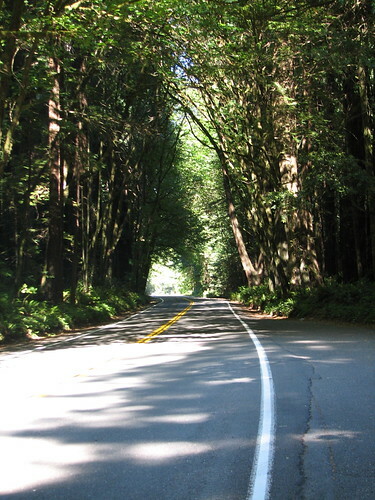 The Avenue of the Giants came to and end all too soon and now I was back on the 101 and it was hot and treeless. Also hilly. I ground up these hills in the relentless sun which just saps your energy. The road narrowed and began to wind through valleys with little shoulder. I was rationing my water and I also had developed another slow leak in the rear tire (it’d been a while but this was unwelcome). 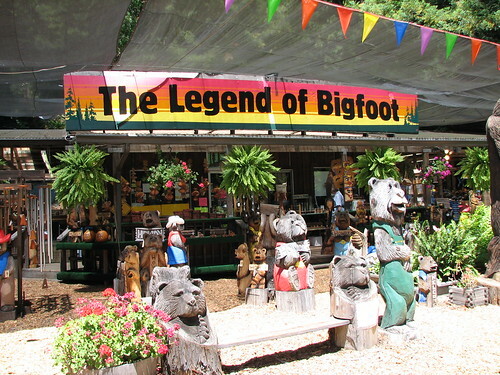 Hot and thirsty I pulled over at a roadside attraction of tacky woodcarving called The Legend of Bigfoot where I was able to buy water. 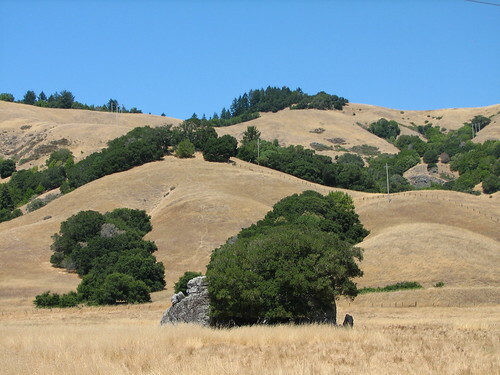 A bit further on was Richardson Grove State Park where I again pulled off and I changed the tire and reapplied the sunscreen. Back on the road which was quite narrow and winding through the woods (whose shade was a relief) there was an increase of these tourist traps. Realizing I hadn’t eaten much I pulled over at one of these for a sandwich. From here it was shadeless hot rolling hills, for miles with only a short section off the 101. After a bridge crossing and a climb to the top of Confusion Hill the trees came back and I was so happy to see them. It was up and down for a bit and then after a climb I was at Standish-Hickey State Park around 3:30- an early arrival. There was only a few other riders here at this point but after a shower (quite welcome), a trip to a nearby store for a beer (very welcome) and dinner (needed) the camp was again filled with tourons including a new fella from my old hometown of Bothell of all places. I took a walk down a very steep and dusty road to Eel River after dinner where it was nice and cool. 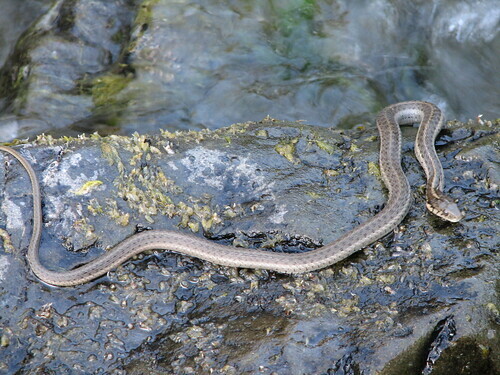 At the river I sat on a rock and cooled my heels in the water and watched this snake swim around and under this rock, occasionally come up on to it to sun itself. As the sun went behind the hill I returned to camp and was shortly chased into my tent by the mozzies. 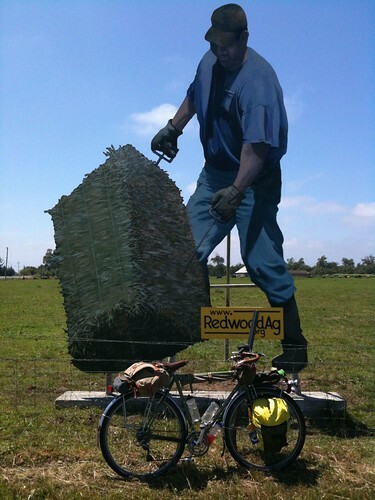 This was truly a great day of cyclotouring, one that had everything: it began in an interesting town, wandered through scenic farmland and ended back in the Redwoods along the famous Avenue of the Giants. It was almost as short of a route as the previous days so I really milked it too, I did all the scenic routes and extra side rides mentioned in the guidebook. Even though it was going to be a short day I hit the road earlier than ever. This was mainly because I was out of alcohol for my stove so I couldn’t make my usual breakfast coffee and oatmeal. 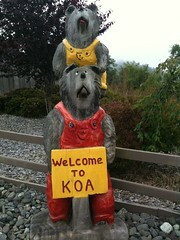 It was gray and foggy and starting to mist as I left the KOA with a plan to hang out in Eureka at a coffeehouse. 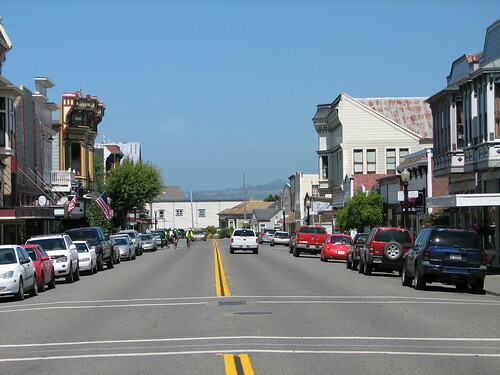 It was an easy ride into Eureka and once there I followed the guidebooks scenic route through the Old Town part of the city. This was at first old Victorian style houses but then it became the towns original downtown which was fully restored and packed with shops. On the edge of Old Town was Has Beans Coffee Roaster where I stopped and hung out for some time drinking coffee and eating a bagel and cinnamon roll. I also ended up talking to this guy about touring for quite some time, he was a long time cyclist wanting to start touring. I then walked around Old Town Eureka, visited the Eureka Books, the Old Town Art Gallery until it was about lunch time for which I went to the Lost Coast Brewery. I had their 8-Ball Stout, which was thick and malty, and their Double IPA which was good, hoppy but fairly well balanced by the alcohol. The sun had burned away the fog by now and it was a bright clear day as I returned to the 101. The 101 was fine, pretty easy riding for he most part, but I took every opportunity offered to not ride on it. The first of these was a somewhat hilly route to the tiny town of Loleta, where I stopped at the Loleta Cheese Factory and sampled tons of cheese. All of it was Cheddar and Monterrey Jack based but with various additions. My favorites were their hickory smoked cheeses and I bought small bar of hickory smoked Monterrey Jack to have with dinner. Back on the road I encountered a fruit stand and got a pluot and a white nectarine for later. You can’t beat being able to pick up this fresh and locally produce foods. 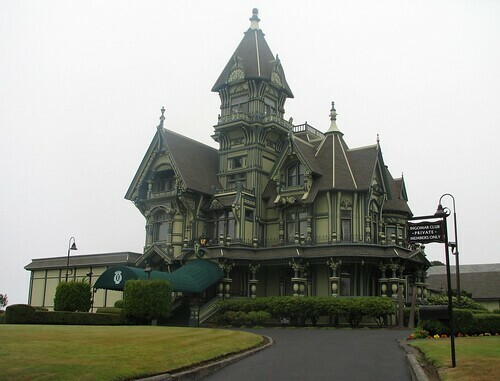 I was able to route right onto the second alternate route without returning to the 101, which ending up adding miles but was great riding through green farmland to the small town of Ferndale which is filled with seemingly out of place Victorian architecture. It’s main Street was the very definition of quaint all antique shops and candy makers. 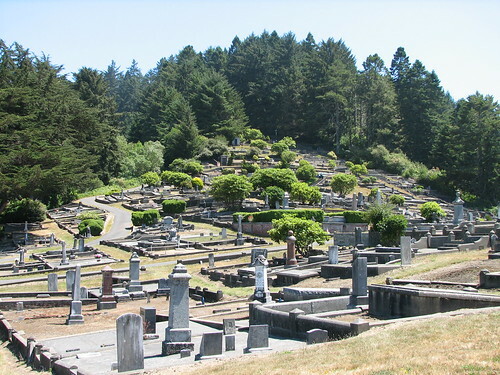 The most interesting part to me was the cemetery which was on this hill and terraced with masonry walls. Sort of reminded me of some of the cemeteries in Japan, though of course not nearly as dense. Riding out of Ferndale was again across farmland but with a wicked tailwind. I made great tome until this series of three steep hills at the end. It was hot now to boot. Back on 101 for only a couple of miles before I pulled off at the next alternate route to the little town of Scotia. I got water and applied sunscreen here but passed on the recreational activities which were all logging oriented. This one was only off the 101 for a mile or two, and then it was the highway again. But this was the last stretch of the day here and it wasn’t long before I exited on the Avenue of the Giants. 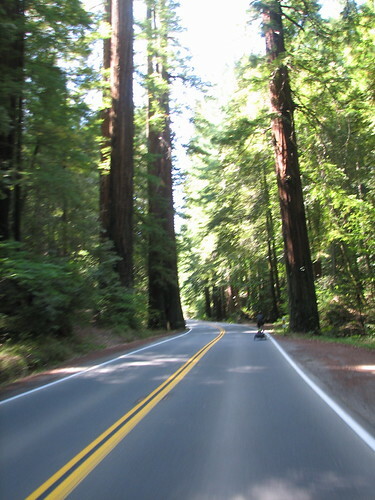 The Avenue of the Giants is the most well known of the Redwood parks and it is again an amazing ride through these incredible trees. Not quite as impressive as the road along Prairie Creek but it was still a great way to cap the days riding. After about fifteen miles in the trees (stopping constantly for pics or to just gaze in awe) I made it to Burlington Campground where the Hike/Bike area wad small and packed. There was the biggest crowd I’d seen at a campground to date: the usual couple, a pair of German girls I’d last seen at Cape Lookout, a solo German girl, a pair of guys riding south to north who were also rock climbing as they went and several more I didn’t meet. A boisterous bunch who did various levels of ambitious cooking including making lasagna in a fire pit. I pitched my tent right in between two others and ate my cheese, fruit and crackers sharing with several others. I went for a short walk in the trees with the couple and then chatted for awhile with the south to north boys before retiring. I had expected to be woken by the sun again so had handwashed some clothes and hung them on a line so the sun would dry them. So of course it was overcast, foggy and clammy this morning. Today was a pretty short day of riding so I didn’t rush anything and was ready to go by around 9am. At this point the sun was out and I was overdressed so I removed some layers and headed out. I took a gravel bicycle trail out of the camp this time which went through some Redwoods – a nice farewell to this valley. Back on the highway there was a bit of a headwind but as the road was mostly downhill for the the first five miles this was not problem. Hitting Orick I stopped to once again to use the WiFi from the cafe that had spurned me yesterday, before resuming my travels. The road went up a bit as it returned to the coast and the fog was back. I was now a bit under-dressed but I figured it’d burn off and pushed through. The road was mostly uneventful on this day with only a couple of scenic stops. The first of these I skipped due to the thick fog obscuring the views. There was a really nice section if road that rolled and curved through trees and coastline before emptying out into a big lagoon. After that though the 101 became a real highway with entrance and exit ramps that had to be negotiated. 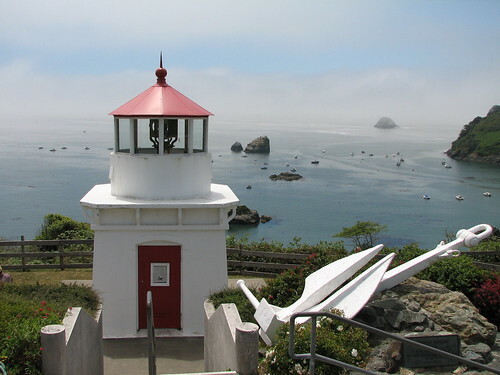 I stopped at the little town of Trinidad to get groceries and have lunch at the second of the scenic spots, a lighthouse overlooking a harbor. The sun was coming out now, the fog burning away reveling a beautiful view of a rock strewn harbor filled with boats. I had a nice lunch there and then returned to the road. 101 was a 4 lane highway at thus point and I just rode through it. 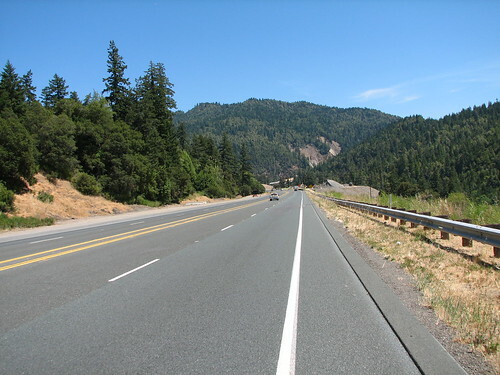 There was one short frontage road the route took which was a nice stretch off 101. Right as I was about to get back on the hwy I ran into the beerhounds just exiting. 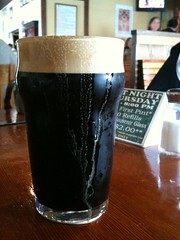 They were heading into McKinleyville to visit the Six Rivers Brewery and needing to kill some time I went with them. Their route showed a bike path into town which mine did not so we rode on that for a time. It was partially paved becoming gravel at it’s one point of climbing (of course). After the trail we rode city streets to the brewery. There we all had IPA and porter and they had a late lunch. The beer was good if nothing remarkable, made better by riding in the now hot sun. This was good times talking beer, touring and travel in general. They are riding well past my stopping point tonight, which is too bad, they’ve been great occasional companions. After that I rode with them on the 101 (they set a wicked pace) until the KOA where I was staying. We made our farewells and it was to camp for me. This us the only non-park camp on the route and the first time in all my years of camping I’ve stayed at one and it is pretty bizarre. More like a big cut-rate resort than camping; the gated community of camp… err sorry kampgrounds. 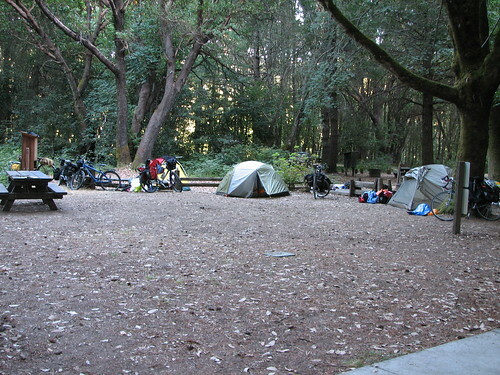 But they had a seperated bicycle camping area, showers and I was able to do laundry here, so for one night, it’s okay.